I mentioned last week that I have been traveling quite a bit this summer, so I'm running out of quilt-related content for the blog. 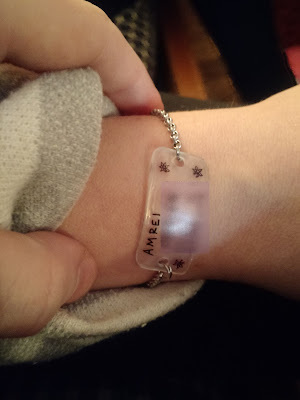 I was in Illinois during May visiting friends and made a couple of these shrinky-dink safety bracelets. They aren't quilt-y and it might be a stretch to call it charity, but I thought some of you might find it useful. Shrinky-dink is a plastic that shrinks and thickens when you put it in the oven, so I first wrote Amrei's name and her parent's phone numbers and drew a couple of flower designs in sharpie. Then immediately after baking and shrinking I bent it around a drinking glass to make a curved shape to fit her wrist. 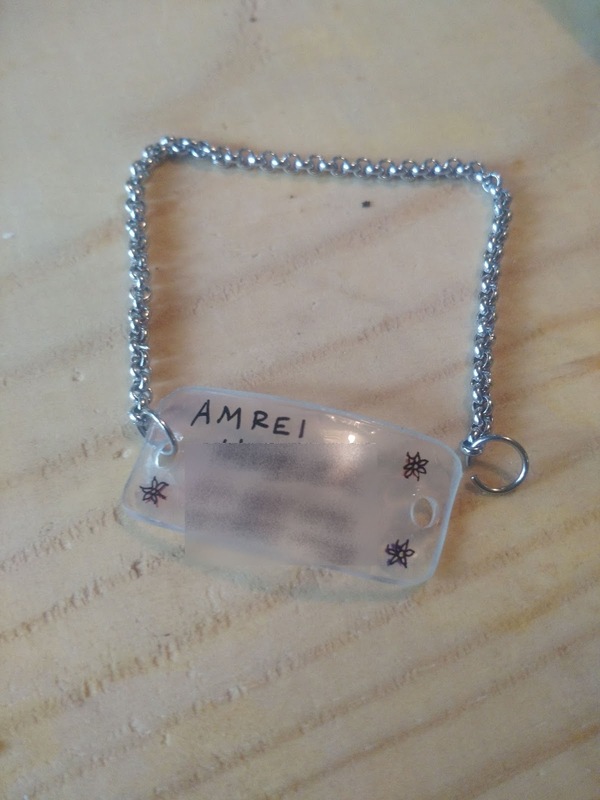 I sealed it with Dimensional Magic and attached a chain with pliers so it does not come off. She's been wearing it for over a month and it still looks good and seems well attached! She likes it and it's prettier than a usual medic alert bracelet. Oh, that's so cute for a young girl! I didn't know Shrinky Dinks were still around. We had a couple of young visitors yesterday, a brother and sister aged 4 and 7, and they both spent some time seriously stitching on their projects. They used big plastic needles, yarn, and a grid of perforated white plastic for their embroidery "cloth." So fun to see young crafters at work!